Up for sale we have a 1966 Chevrolet Chevelle SS. This is a true 138 vin code Super Sport that has undergone a fresh frame off rotisserie restoration. It's a stunning restoration that features some awesome drivetrain options along with a head turning color combo. From first glance you can see this is a high-end restoration with all off the hood, trunk, and door gaps being excellent. Also, the fit of all the panels are phenomenal and the body is straight as an arrow. It's covered in the Tuxedo Black base coat clear coat paint that's slick as a ribbon and has a mirror finish. All the chrome and stainless on this SS has either been redone or replaced. From the bumpers to the rocker molding every piece looks amazing. As for the glass it appears to all be new along with the seals and felts. You'll also notice new weather stripping has been installed. To finish off the look it has a new set of 18” and 20” Billet Specialty Wheels with new tires, 275/35 in the rear and 225/40 on the front. On the inside, it's done in Red which is a gorgeous complement to the exterior scheme. It features the front bucket seats and console that houses the Hurst four speed shifter with the Muncie Handle. The seat covers have been replaced and all the padding is very good. All the door panels have also been replaced and are still like new. This Chevelle has all the in-dash gauges working from speedometer to the fuel gauge. Also, the knee knocker tach is working! Inside the trunk is rock solid with new weather stripping and a trunk mat. Under the hood it's powered by a fresh built '69 Model 396 that has a Competition Thumper Cam along with new rings, bearings, and lifters. It's badged up as 427 because it's sporting a set of '67 model 427 GM Aluminum Heads. Also, this 396 is set up with a winters intake and a Holley Carb. It's dressed in the Chrome valve covers and breather. This 396 is mated to a Muncie Four Speed and 12 Bolt Posi Rear end. Now this Super Sport is more than just muscle under the hood, it's also been upgraded with Vintage AC and Heat. Along with having Air Condition you also have Power Steering and Power Brakes with disc on the front. Under the front end new ball joints, end link bushings, and sway bar bushings have been installed. When you look under this Chevelle you'll see the factory style manifolds run through the Dual Pipes and Flow Master Mufflers. Take a close look and you will see they did an exceptional job with the frame off restoration. All the floor pans are rock solid along with the frame. Also, this '66 has had a new gas tank installed along with new fuel lines and brakes lines. The Chevrolet Chevelle is a mid-sized automobile which was produced by Chevrolet in three generations for the 1964 through 1978 model years. Part of the General Motors (GM) A-Body platform, the Chevelle was one of Chevrolet's most successful nameplates. Chevelles were made available in coupes, sedans, station wagons, and convertibles. The SS (Super Sport) was produced through 1973 model year, and represented Chevrolet in the fight for the great American Muscle Car. The Lagunas were produced from 1973 through 1976, and the El Camino was released a few years later. With the classic Chevelle for sale, Chevrolet answered Ford's Fairlane and Plymouth Belvedere, and was a return to the size and concept of popular models from 1955-57 Chevy. The Chevelle's 115-inch (2,900 mm) wheelbase was the same as that of the 1955-57 Chevy. Chevrolet succeeded in their attempt to leave their mark on the American Muscle car. 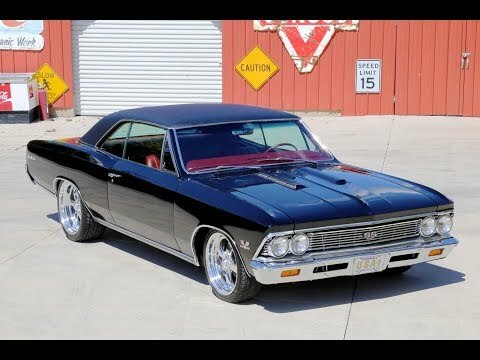 By mid 1964, Chevy already swapped out it's top engine from a 220 horsepower 283cid to a 327 that made 300 horsepower instead. With that, GM had made a power move in an effort to fit into the performance niche. In the '65 model, Chevy raised the bar again giving the Chevelle a boost to a 350hp L79 engine for the Super Sport (SS) trim model. This was one of the key components that marked the beginning of the muscle car era.